Cast your mind back to March 1969. The Troubles had yet to manifest themselves. Sinn Féin was a single organisation, as was the IRA. 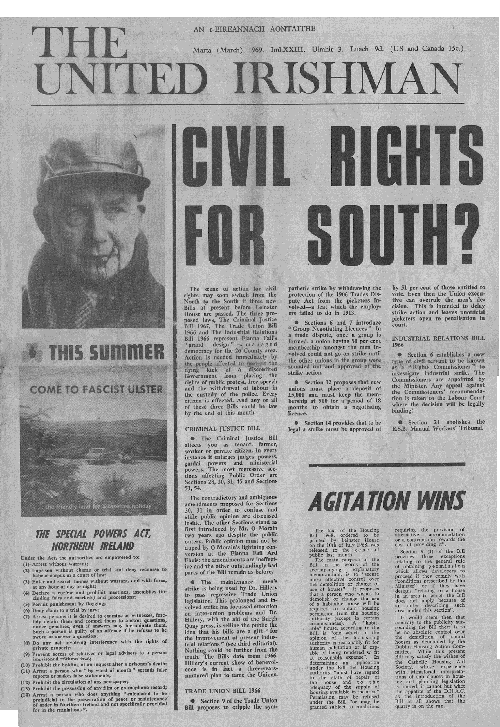 Almost unbelievably [and I’d like confirmation of this] Eamon Mallie and Patrick Bishop in their work on PIRA suggest that the first Civil Rights Association branch in Belfast was organised that April]. And April was to see the first serious clashes there between CRA members and the RUC. So, if not quite the calm before the storm, it was certainly only in the first stages of the storm. But, as Richard English has noted, in 1966 the IRA’s strength was about a thousand, and in that year a plan had been drawn up to restart a campaign in the North. Indeed English writes that ‘in Belfast the IRA had grown significantly between 1962 and 1969. All of this should caution against too simplistic assumption that the organisation was militarily dead in the 1960s… in part however such martial noises as the IRA made during the decade were required precisely because Goulding did indeed want his army to embark on a new departure into radical politics’. In this context what then was the message coming from the Republican movement? Well, a mixed one which clearly tilted towards civil activism but hasn’t forgotten the past, as evidenced by an article on the 1939 campaign. One can but applaud the series on the counties of Ireland (Gaillimh in this edition) and the sidebar on estates of more than 400 acres, or indeed the tips on ‘defence tactics for demonstrators’. Roy Johnstone has an article on the Irish Labour Party. We read a piece on the Independent Orange Order. The editorial criticises Peoples Democracy (not least for its stance on partition) and interestingly argues that ‘confrontation in the Six Counties must not be pushed beyond its real use’. An indication of future directions perhaps in the following sentence ‘In its extreme form as in Newry it polarises religious attitudes, as each side springs to defend “its own”. The design of this newspaper is good with a strong visual approach that would put some commercial publications of the time to shame. I hope this will be the first of a regular posting (but trust me, not every week) of successive UI’s through 1969 and on through to 1972 which will be an interesting means of charting the changes that occurred as Republicanism ruptured and very different approaches established themselves in those crucial years. serious challenge to the FF-FG monopoly? Very very interesting question Starkadder. My answer FWIW. Probably not. Having said that, there has been, and I think still is space for a socially reforming/socialist/left Republican part on the Irish political spectrum. FF in its first incarnation filled this spot. Clann na Poblachta likewise. Somewhat second cousinish, we see a similar dynamic with the WP. Currently SF as is are there or there abouts. Perhaps it’s not so much a space as an appetite. BTW, I agree that this is a quality production. Both in design and in terms of the range of material covered, and the nature of it. Ah, the premature Eurocommunist strain alive and well in March 1969. Brilliant. Did you notice the Irish Predator Buidling Society mock ad? Or the notices for Mass? Now that was never in the Irish People. Missed the notices for mass. Obviously trying to get the fuckers from Kerry back! Saw the Irish Predator thing. Good stuff. The Northern People had some good cartoons for a while until a tragic accident stopped that. There’s no newspaper of comparable range I don’t think on the left in the Uk or Ireland today. April 1st and this has given me my biggest smile.